I wanted to give the blog a makeover! Make it bright, crazier and a little bit glamours! I have a new button (on the sidebar) but no worries, the old ones will still work! I'm totally loving the bright color! -Background from Polka Dot Pixel's design scrapbook papers Friendly. -Girl silhouette from Hero Arts' package called High Profile. -Social Networking icons from Pretty Lovely Design. -Font is Channel from PicMonkey premium. P.S. 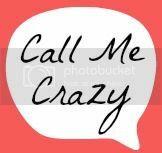 Don't forget to enter Call Me Crazy's 'Crazy in Love' Valentine's Day Giveaway! This is adorable! :D love it! Oooo you know I love it. It has pink, black and white, and silhouettes. Gorgeous! So cute-that's so neat that you made it yourself! Wow, I really like it! It's so awesome that you put it all together yourself. I've been trying to learn designing myself and I will someday get there. Great effort, love the color palette and everything. Oh WOW Katie!! So pretty, I love it! I am so surprised that you made this on your own because it definitely looks like you paid big money for it! It looks amazing!! How did you teach yourself how to do this?? Give me lessons please!! !